Pure (ISO 3696 Grade 2). 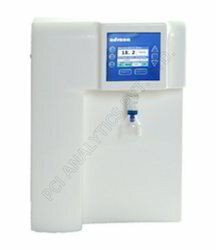 Ultrapure water produced by the Crystal E systems has resistivity 18.2 MegaOhm*cm (conductivity 0.055 μS/cm). This exceeds requirements of all the relevant standards (ISO 3696 Grade 1, ASTM Type I, CLSI Type I). Purified water is collected in a storage tank. The recirculation system ensures a consistent quality of water, and a low level of organic carbon content (TOC). TOC is <2 ppb for "HPLC" and "Bio" configurations, and 5-10 ppb for the "Trace" configuration The dispensing rate of high-quality Ultrapure water is 2 L/min. Pure water produced by Crystal E systems can be used for labware e washing,wet chemistry methods, flame spectrophotometers,et c. P.ure water is dispensed directly from the storage tank.Th e dispensing flow rate of Pure water is 4 L/min. Looking for Laboratory Ultrapure Water System ?